Reports are surfacing regarding alleged plagiarism by Patricia Waddell, author of the sci-fi romances TRUE BLOOD and TRUE DECEPTION. Jeremy Dun has become a crusader against plagiarism. Dun is a well known author of thriller fiction. He was asked to blurb a book and gave a glowing one. After the book was published, it quickly became clear that the book was heavily plagiarized. This has led Dun to seek out other instances of plagiarism and it appears to be reaching into some of the highest echelons of publishing. The latest alleged perpetrator is Patricia Waddell who has reportedly taken passages directly from Robert Ludlum books. One commenter at Jeremy Dun’s site noted specific passages. There’s also speculation there that the reason TRUE DECEPTION’s allegedly plagiarized passages escaped detection for so long is because it’s a paranormal romance. This is very discouraging news. Patricia Waddell is with Macmillan. Is it too much to hope for that the publisher will address this issue? I have TRUE BLOOD on my bookshelf but haven’t read it yet. Now, I’m hesitating to even start it given these allegations. 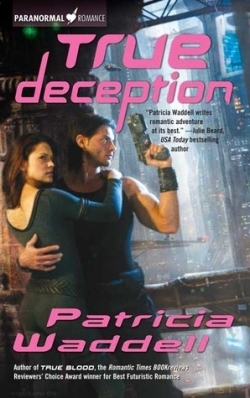 I haven’t read any of Robert Ludlum’s books so I wouldn’t be able to recognize his work if I saw it, but knowing plagiarized passages might exist in the science fiction romances of Patricia Waddell is a deterrent. Plagiarism is a terrible disservice to readers. I’m mourning the loss of a potentially enjoyable science fiction romance. What are you thoughts?